Zumba Fitness is perfect for everybody and every body! Each Zumba® class is designed to bring people together to sweat it on. Zumba takes the "work" out of workout, by mixing low-intensity and high-intensity moves for an interval-style, calorie-burning dance fitness party. Once the Latin and World rhythms take over, you'll see why Zumba® Fitness classes are often called exercise in disguise. Super effective? Check. Super fun? Check and check. Zumba Fitness is a total workout, combining all elements of fitness – cardio, muscle conditioning, balance and flexibility, boosted energy and a serious dose of awesome each time you leave class. 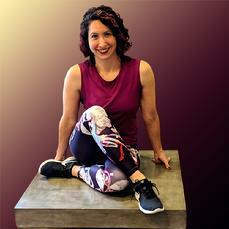 FARAH ABI - Farah Abi has been teaching Zumba Fitness since 2009. Farah hails from Upstate NY, the daughter of an anthropologist, she loves world music and dance. In addition to her fitness certifications through ACE, she’s been studying bellydancing for more than a decade. Her classes will get your heart pumping through Latin rhythms, Bollywood, hip-hop, and of course Bellydancing!